Breathtaking panoramic ocean views surround this rare beachfront estate in the exclusive seaside community of Three Arch Bay. Breathtaking panoramic ocean views surround this rare beachfront estate in the exclusive seaside community of Three Arch Bay. Gracefully situated above a private cove and completely immersed in nature, the magnificent setting includes cobblestone paths that wind through lushly landscaped grounds, an oceanfront terrace spanning the width of the property, and an awe-inspiring lighthouse complete with viewing room and bathroom. In addition to the property’s celebrated lighthouse, the compound encompasses three separate living structures; two guest cottages and a nautical-style main house. The main home was inspired by the Griffith’s love of sea and showcases porthole windows, custom millwork, a cage elevator, and ship’s staircase. Exposed wood beams, wood paneled walls, four brick fireplaces, and cage lights further complement the richly appointed interiors. Equally exceptional, a private stairway descent leads down to the sand and one of few swimming pools in Laguna Beach built into the cliffside that is refilled daily by ocean tides. Accessible by only two properties, this secluded beach is an escape from the ordinary. A two-car garage and a four-car garage deliver on the needs of the modern buyer whilst the property’s antique lift is a decorative relic of this enduring classic estate. Situated behind the guarded gates of Three Arch Bay on nearly an acre of seaside paradise, this incredible property presents a rare opportunity to own a residence of unrivaled beauty and historic value. 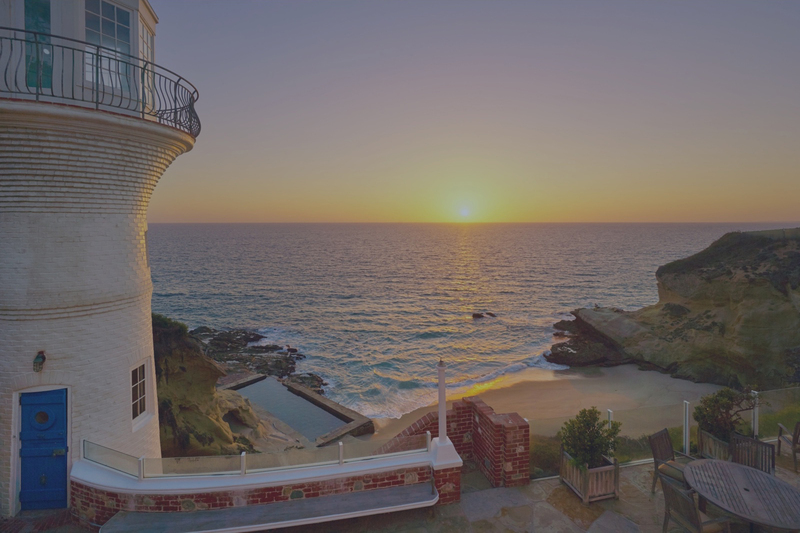 Built by Edward H. Griffith, a famous director, producer, and screenwriter in early American filmmaking, and husband to actress America Chedister, this historically significant residential compound remains a treasured landmark along the Laguna Beach coastline. It has been rumored that the Griffith’s deep love for the sea and cruises prompted their extensive use of teak wood, porthole windows, and other nautical appointments throughout the estate. Edward and America went as far as to extract a boat’s cabin to create the rich wood-paneled guest suite present at the center of the property. An artist’s loft was later added atop the guest room by the estate’s second owner. In an effort to complete their vision and to feel as though they were always at sea; Edward and America ordered the construction of the lighthouse which still stands today. Lovingly maintained and restored by the present and previous homeowners over the years, this extraordinary property has a life of its own and endless stories to tell. *Historical statements are provided by sellers and are believed to be accurate.